It's easy to see that it's apple season around here! 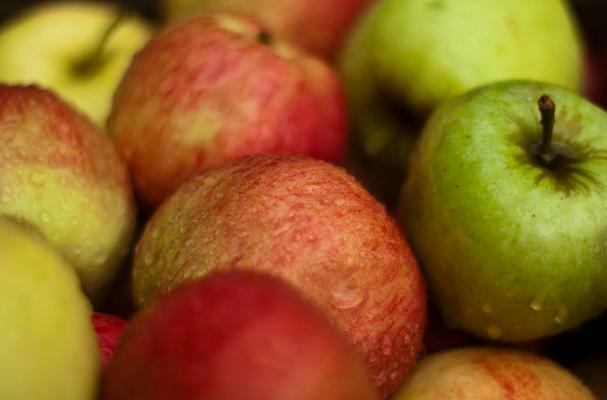 As a native Washingtonian, we haven't quite hit fresh apple season, but we know it's just around the corner. Here are 5 fantastic recipes featuring this autumnal favorite that you simply must try -- and they're all naturally gluten free, of course! This super simple snack is packed with flavor! Fresh apple slices, (homemade) peanut butter and chili flakes make for a sweet, salty, spicy, crunchy, juicy snack that your family will love! A drink-from-the-jar vinaigrette, goat cheese, pumpkin seeds and dried cranberries make this salad a seasonal hit! Bursting with cinnamon and caramel flavors, these melt-in-your-mouth baked apples are comfort food at its finest. These unbelievably delicious bake doughnuts have a secret ingredient: cocoa! It makes the apple butter pop and begs you to take another bite. Apple crumble. In a highball. Need I say more? An Apple A Day: Cute Fruit Snack - a great snack for you or your kids! 5 Great Apple Granita Recipes - if you thought an apple granita was straightforward, you need to check out these recipes! 4 Easy Apple Crisps - a traditional fall favorite! Gluten free, of course! Fall Harvest Apple Cookies - incredibly delicious cookies - substitute gluten free flour in the recipe if you're so inspired.